This is a good news bulletin for all Neenah Image Clip Laser Dark users. Some of you have reported problems using this paper with the GO UNO and other OKI laser transfer printers. Image Clip Laser Dark is used to apply vector or spot color transfers to shirts of any color or fabric. No white toner is required and the transfers are washfast and offer good opacity and color. So what’s the problem? Like all self-weeding or no-weed laser transfer papers for dark garments, Image Clip Laser Dark requires two steps. The first step is to press the imaging sheet and transfer sheet together. The second step applies the transfer sheet to the garment. As they say in the cartoons, that first step is a doozy. That is, it used to be. For a while, we’ve been hearing complaints about inconsistent transfers in step one. We now have some simple solutions for that. Fig 1. A successful completion of the first step with Image Clip Laser Dark looks like this. Neenah Image Clip Laser Dark works like most two-step laser transfer papers. 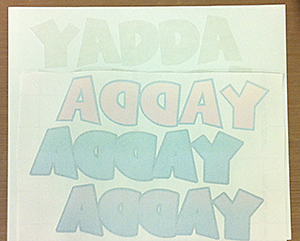 After printing the image in reverse, the imaging sheet must be pressed to the transfer sheet. 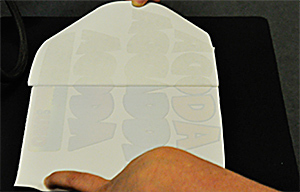 The transfer sheet removes the polymer coating from the unprinted area of the imaging sheet and applies a bottom coating to the toner that allows it to bond to the garment. The instructions direct users to place the sheets face to face and press them for 20 seconds with medium pressure at 250°F. Then peel immediately in a smooth motion. The results should look like this. (Fig 1). You can see a demonstration of the process in section three of our GO UNO webinar. The problem has been inconsistent transfers in which some of the toner gets transferred to the transfer sheet, or the coating from the transfer to the imaging sheet is blotchy. These can make the transfer unusable. That’s not good for you blood pressure or the bottom line. What’s causing the problem? Technically, or chemically speaking, the transfer process is an endothermic reaction. Meaning, the process requires a certain amount of energy; in this case provided in the form of heat and pressure. But the main ingredient is heat. If the paper cools too quickly after the press cycle is complete, there’s not enough energy to support the process and inconsistent transfers are the frustrating result. When the press is closed, the essential thermal energy is generated from the top of the press, the heating element. The table supports the media to ensure enough pressure. But the press table also absorbs heat. And when the cycle is completed and the heating element is lifted, some of that heat is drained from the paper into the table. The standard instructions are to peel the sheets on the platen to keep them warm. Even that precaution can fail if enough heat is drawn from the paper onto the cooler table beneath the platen. Fig 2: The optional bottom-heat platen for the Geo Knight DC16 heat press is an elegant solution. The simple solution is to preheat the table so that, when the press is lifted, there ‘s enough heat left in the table to prevent the paper from cooling too quickly. The best way to ensure this with a standard heat press is to close it for five to six minutes before your first transfer. If you have to print a batch of transfers, go ahead and set the time and temperature before you send the first print job. Unless you’re doing a one-off transfer, this should give you ample time to pre-heat the press before marrying the imaging and transfer sheets. After the press has been closed at the set temperature for five or six minutes, press the sheets and peel according to the instructions. You should find you have a good clean transfer ready for application on the garment. If not, refer to the troubleshooting tips on page two of our Image Clip Laser Dark instruction sheet and adjust your design or process accordingly. If you have a good transfer and need to make more copies, close the press for a minute or two between copies for consistent results throughout the job. If you’d rather not take the time to pre-heat the table, there is a high-tech option. Geo Knight offers a bottom heat attachment for The DC16 Digital Combo and DK8 label press. 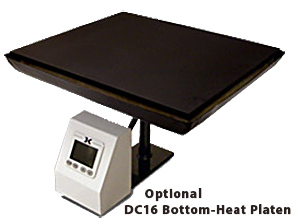 The DC16 option is a 14″ x 16″ platen pedestal with its own temperature controller and digital display. It’s easy to install due to the DC16’s convertible design (Fig2). At $975.00 it’s not cheap, but it would be an investment in efficiency. Fig 3. Placing a Teflon Sheet under the Neenah papers prevents heat from draining into the table. If you’d rather try a faster, simpler option here’s another solution for you. A Teflon sheet can be used under the Image Clip Laser Dark papers to achieve the same effect. Normally the use of Teflon sheets with laser transfer papers is not recommended. And in most heat transfer applications where Teflon sheets are used, they’re place on top of the transfer material, between it and the heat press platen. But in this case, we break both of those rules and add a Teflon sheet to the bottom. This prevents heat from passing from the paper into the table. We used a basic 3 mil Teflon sheet on the table of a Geo Knight JP14 heat press (Fig 3). The results were perfect; a nice clean coating on the imaging sheet and no unprinted polymer left on the imaging sheet. Fig 4. The same paper, press, and settings without the Teflon sheet produced a blotchy separation. To test these results, we used a print from the same imaging sheet. We removed the Teflon Sheet and kept all the settings on the heat press the same. When the Teflon sheet was removed, and the sheets were separated, the results were not good. 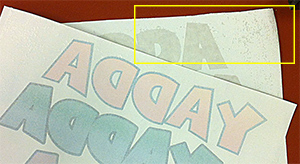 The transfer of the white unprinted polymer coating to the transfer sheet was blotchy as was the transfer of adhesive coating from the transfer to the imaging sheet (Fig 4). This would have been an unusable transfer. Putting the Teflon sheet beneath the Image Clip Papers made all the difference between success and frustration. The next time you use your GO UNO with a two-step laser transfer paper, if you get inconsistent results with the first stage, try pre-heating the table, using a bottom heater, or a simple Teflon sheet over the table. Any of these solutions will give you the consistent quality you need. Your two-step dark garment decoration transfer process will be trouble-free, productive, and profitable.